"Cosmic Creativity: Awakening to Multi-dimensional Awareness"
Thirty-one dedicated evolutionaries came together for five days in June for the Evolutionary Leaders retreat at the beautiful Chapel of Sacred Mirrors in Wappingers Falls, NY – in deep reflection, dialogue, meditation, drawing, laughing, walking the labyrinth, drumming, yoga, toning, walking meditation, dancing, and experiencing the glorious visionary art of Alex Grey and Allyson Grey. 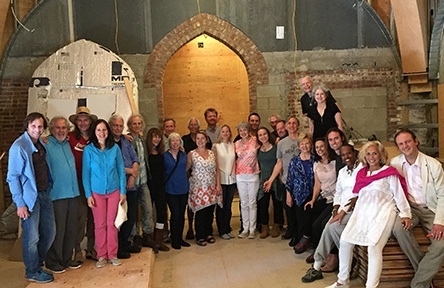 The group explored "cosmic creativity" and built a collective field for positive action in support of the conscious evolution of humanity. And they joyfully celebrated the 10th anniversary of The Source of Synergy Foundation, which originated and coordinates the Evolutionary Leaders circle. Participants: Panos Anastasakis, Lawrence Bloom, Ben Bowler, John Clausen, Jude Currivan, Justin Faerman, Alan Gegenschatz, David Gershon, Alex Grey, Allyson Grey, Olivia Hansen, Kristin Hoffmann, Kurt Johnson, Domen Kocevar, Pamela Kraft, Barbara Layton, Bruce Lipton, Nina Meyerhof, Deborah Moldow, David Nicol, Denise Scotto, Alan Steinfeld, Sylvia Sumter, Katherine Woodward Thomas, Kit Thomas, Jeff Vander Clute, Rick Ulfik, Cassandra Vieten, Claudia Welss, Diane Williams, and David Sloan Wilson.